As a general rule, North Carolina's fireworks laws are pretty restrictive. Their neighbor to the south, South Carolina, does have much more accepting laws, though, and many people travel over the border to get their annual fireworks. In fact, most fireworks are legal in South Carolina. Remember, many fireworks you can purchase across the border are not legal in North Carolina, so use them at your own risk. But what fireworks can you have in North Carolina? Here's a rundown. Fireworks that are legal in North Carolina include poppers, sparklers, fountains and other novelty items that don't explode, spin, leave the ground or fly through the air. The Apex Fire Department puts out a great list of examples of legal fireworks: snake and glow worms, smoke devices, noisemakers like snappers and string poppers, and wire sparklers. Many people mistakenly believe that all fireworks are legal on holidays like July 4, but that's not true. The same laws still hold true all year. Also, the city of Apex abides by the same rules as the rest of the state. As mentioned above, South Carolina laws are far less strict. In South Carolina, you can purchase fireworks at age 16 and you can buy pretty much any personal-type fireworks. The only ones that are banned are exploding fireworks like M-80 and Cherry Bombs and the small rockets that are illegal almost everywhere. Fireworks that are illegal in North Carolina include firecrackers, ones that spin on the ground, roman candles, bottle rockets, or any aerial fireworks. Essentially, any firework that explodes or leaves the ground is not legal in North Carolina. State law requires that anyone shooting indoor or outdoor fireworks must submit an application to the State Fire Marshal, attend a safety class, and pass a written exam. Contact the North Carolina Department of Insurance (NCDOI) for more details on these rules and Pyrotechnic License. Violators of the state's fireworks law face a misdemeanor charge that is punishable by a fine of up to $500 and or imprisonment of up to six months. You must be 18 years old to legally buy fireworks in North Carolina. The age of fireworks purchase is 16 in South Carolina. 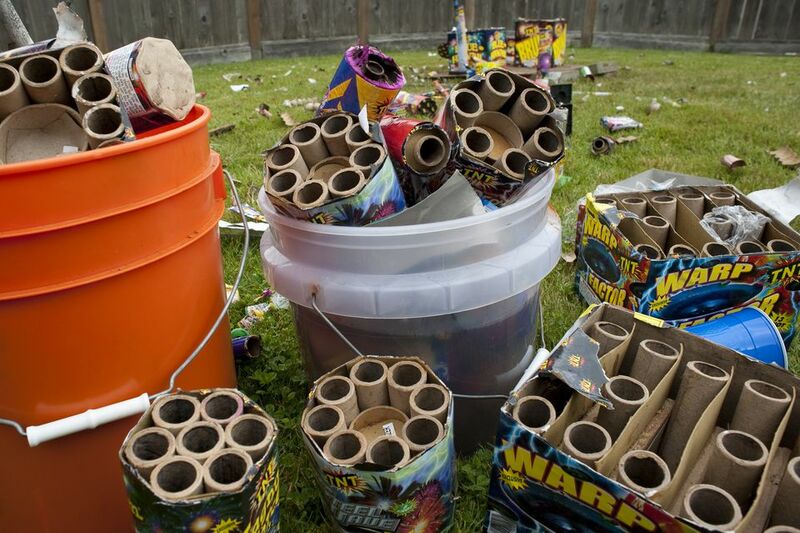 Buy from reliable fireworks vendors Never alter fireworks or try to make your own. Loose clothing should not be worn while handling fireworks. Have a hose or bucket of water nearby in case of a fire emergency. Light one firework at a time and move away from it quickly. If a firework does not light the first time, do not attempt to light it again. Ignite your fireworks outdoors on a paved surface, away from grass, trees and other vegetation. Never shoot fireworks from a metal or glass container.